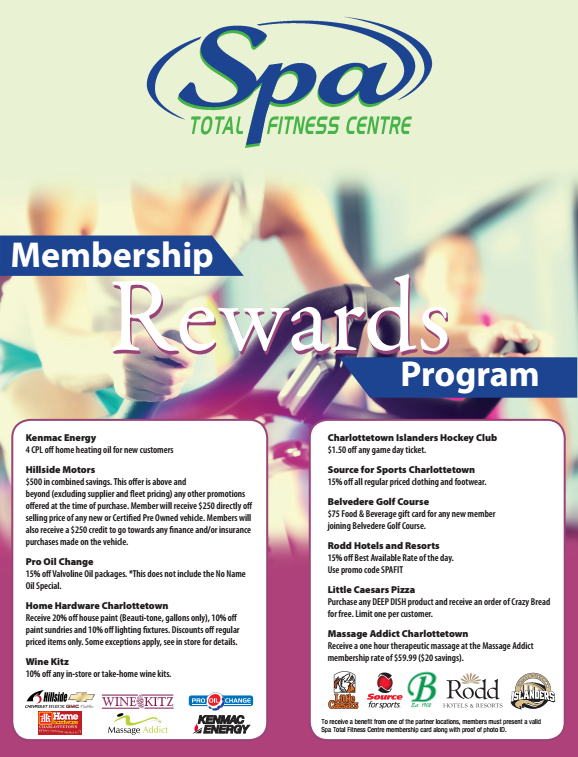 As a member at The Spa Total Fitness Centre you are eligible to participate in our Membership Rewards Program. We have partnered up with local businesses across the Island to provide members with special savings. The program is available to all members- all you need to do is show your valid membership card along with photo ID. 4 CPL off home heating oil for new customers. $500 in combined savings. This offer is above and beyond (excluding supplier and fleet pricing) any other promotions offered at the time of purchase. Member will receive $250 directly off selling price of any new or Certified Pre Owned vehicle. Members will also receive a $250 credit to go towards any finance and/or insurance purchases made on the vehicle. 15% off Valvoline Oil packages. *This does not include the No Name Oil Special. 10% off any in-store or take-home wine kits. $1.50 off any game day ticket. 15% off all regular priced clothing and footwear. $75 Food & Beverage gift card for any new member joining Belvedere Golf Course. 15% off Best Available Rate of the day. Use promo code SPAFIT. Purchase any DEEP DISH product and receive an order of Crazy Bread for free. Limit one per customer. Receive a one hour therapeutic massage at the Massage Addict membership rate of $59.99 ($20 savings). Receive 20% off house paint (Beauti-tone, gallons only), 10% off paint sundries and 10% off lighting fixtures. Discounts off regular priced items only. Some exceptions apply, see in store for details.